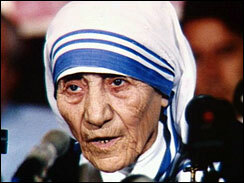 Mother Teresa in "Her own words"
Excerpts taken from letter’s written in her book as edited on CBS News (click to see full story). 16. Finally, those who have not yet received the gospel are related in various ways to the People of God…the plan of salvation also includes those who acknowledge the Creator. In the first place among these there are the Moslems, who, professing to hold the faith of Abraham, along with us adore the one and merciful God, who on the last day will judge mankind. Nor is God Himself far distant from those who in shadows and images seek the unknown God, for it is He who gives to all men life and breath and every other gift (cf. Acts 17:25-28), and who as Savior wills that all men be saved (cf. 1 Tim 2:4). This leaves me with two thoughts: Muslims worship the same God? And Catholics wonder why fervor for evangelism is so obviously missing? "Anytime a Catholic converts to a fundamentalist Evangelical denomination, ‘Even the altar cries,’ and so should we."